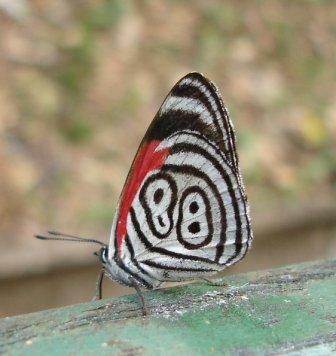 Butterfly from Iguacu Falls, Brazil - see lucky number 88? Every culture has a number, or numbers, they consider lucky. Lucky Numbers for Chinese also exist. Many people consider the number thirteen a bad luck number while others consider this a good luck number. Even countries fall into this category. It could be because of superstitious beliefs or because something fortuitous happened and a certain number represents it; for example the United States and its thirteen original colonies. That thirteen is an important symbol on the U.S. Dollar Bill. Which number(s) is lucky depends on the person and the culture. In Chinese culture, certain numbers are believed by some to be auspicious or inauspicious based on the Chinese word that the number name sounds similar to. However some Chinese people regard these beliefs to be superstitions. Since the pronunciation and the vocabulary may be different in different Chinese dialects, the rules are generally not applicable for all cases. If some people have special numbers that are lucky to them, they will try to get things with those numbers such as an automobile license plate, a phone number, a driver’s license, and more. If you are of the persuasion that numbers are not important think twice about that. Some people are willing to pay a huge amount of money for these numbers. The word eight sounds like the word that means prosper in Chinese and many other dialects it sounds like growth with prosperity. This is considered a universal lucky number. If you have a number, such as a driver’s license, or phone number, with several eights, this is considered a very lucky number. The Chinese consider it a lucky number because of its perfect symmetrical shape. The number 8 is viewed as such an auspicious number that even being assigned a number with several eights is considered very lucky. Here are some of examples surrounding the “lucky” number 8*. A telephone number with all digits being eights was sold for USD$270,723 in Chengdu, China. The opening ceremony of the Summer Olympics in Beijing began on 8/8/08 at 8 seconds and 8 minutes past 8 pm (local time). A man in Hangzhou offered to sell his license plate reading A88888 for RMB 1.12 million (roughly USD$164,000). The United Airlines route from San Francisco to Beijing is Flight 888. Dragon Fish Industry in Singapore, a breeder of rare Asian Arowanas (which are “lucky fish” themselves, and, being a rare species, are required to be microchipped), makes sure to use numbers with plenty of eights in their microchip tag numbers, and appears to reserve particular numbers especially rich in eights and sixes (e.g. 702088880006688) for particularly valuable specimens. The value of eight could also be linked with Buddhism and the meaning of Lotus flower (eight petals). An “auspicious” numbering system was adopted by the developers of 39 Conduit Road Hong Kong, where the top floor was “88” – Chinese for double fortune. It is already common in Hong Kong for ~4th floors not to exist; there is no requirement by the Buildings Department for numbering other than that it being “made in a logical order.” A total of 43 intermediate floor numbers are omitted from 39 Conduit Road: those missing include 14, 24, 34, 64, all floors between 40 and 49; the floor number which follows 68 is 88. The Chinese believe this is a good luck symbol because good things come in pairs. Universally, this number is the luckiest number. It is the perfect number and symbol of fertility and completion. It is lucky because of the proverb that said third time lucky. It can be a good or bad luck symbol in regards to things either happening or coming in threes. In China when you say the number three, it sounds like the character for birth, thus making it a lucky number for them. In China, it is a good luck number because it represents the five elements, wood, water, earth, fire, and metal. This is a good luck number for business people in China. This is a good luck number because it symbolizes togetherness in Chinese and is a lucky number for relationships. This number sounds like the Chinese character that means arise. It is recognized as the luckiest number in the west. This number started in the biblical times as being a lucky number because on the seventh day, the Lord rested. A theory based on numerology is that if your birth date can be combined into a single digit that can be divided by seven, you will have a very lucky year. In China, it is considered lucky because it is the same word as life force and positive energy. This is the greatest of all single-digit numbers according to the Chinese. It is the highest odd number and sounds like the word long life in Chinese. In China, the numbers seven, eight, and nine are lucky numbers, and any combination of these numbers will bring you good luck. During the sixth century, the Greek philosopher Pythagoras believed that the numbers three and four were lucky. If they were added together, they would become an even luckier number. On another topic, think of all the people who play the lottery. Numbers are extremely important to many of them. Common numbers like birthdays, ages of children addresses, etc. are some of the first things thought about when picking numbers for the lottery. Other more sophisticated lottery players look to frequency of number occurrences or even those numbers that do not show up frequently, all in order to gain an edge in what otherwise is an exercise in extremely good luck in picking the correct lottery numbers. There are many reasons why this number or that number is lucky. It could have something to do with the culture, superstitions, or for each person’s own personal reasons. chinese lucky number, chinese lucky numbers, good luck number, lucky nimber, lucky numbers, number 3, number 8, number 9, Number thirteen. Bookmark.